One Friday in late January, I was in the middle of what I thought was a normal Friday demo at SocialCops. With the Growth, Data, and Business teams out of the way, it was time for the engineers to take the stage. First up was Chetan Bhasin, who works in Infrastructure at SocialCops. I always have trouble with the infrastructure demos. Our product engineers can demonstrate their weekly updates on the products themselves. However, this doesn’t work for infrastructure because it usually doesn’t have a front end. To make matters worse, I have no background in software or engineering, so the technical details of our infrastructure demos usually go straight over my head. Not this Friday. As soon as Chetan walked up, I knew something was different. Instead of dense lines of code, the projector showed a bright blue screen with self-deprecating text. At first, I thought the silly title page was just a one-off stunt, but Chetan kept riffing on this theme throughout his demo. He talked in depth about our company’s infrastructure while making fun of the design and colors of his presentation. That was the most engaged I had ever been with an infrastructure demo. Even as the demo went into complex technical details, the format of the presentation kept me engaged and interested. I later asked Chetan what prompted this change. Varun, our co-founder, had asked Chetan to do a simple demo to explain our infrastructure. Chetan decided to make it fun since even he found infrastructure boring at times. The reaction was so positive that he ended up doing a six-part series of funny, visual demos. Each of these demos was unique. Some used a wide selection of bright colors, while others stuck to simpler color palettes. Some used flow charts created on the computer, some stuck to simple text, and some featured handmade drawings. I never thought I’d say this, but these infrastructure presentations became one of my favorite parts of each demo. I’ll admit, I’m biased toward presentations with cool graphics and pictures. However, even the non-visual presentations were fun. Several weeks into the series, Chetan realized that people were counting the number of times he said “Lens” and “Fuji”, the names of two pieces of software he was building. Each demo, he would say each word one or two dozen times within just five minutes, which was a constant source of amusement among the team. In the fourth demo, I perked up when it was Infrastructure’s turn, readying myself for an onslaught of cool pictures. Other people got their pens ready for the “Lens” and “Fuji” count. All of us were in for a surprise. The demo didn’t use cool pictures or “Lens” and “Fuji”. Instead, the demo substituted Lens with “search thingy” and Fuji with “file store thingy” for the entire demo. You’d think this would lead to confusion, not a great demo. But, like me, you’d be wrong. Once I realized what was happening, the demo became really engaging. The rest of the team and I were on the edges of our seats, waiting for Chetan to slip up and say “Fuji” or “Lens”. The downside — Chetan kept it together, only dropping one “Lens” into the demo. The upside — I learned a lot about new features in Lens and Fuji. That demo was fun, but my favorite presentation was one with hand-drawn illustrations. It was one of the last things I had expected out of our engineering team. Let me get it out of the way — Chetan’s drawings are terrible. (Mine are even worse though.) However, they served their purpose. They made me laugh and listen closely, waiting for the explanation of how Mother Earth and Bajirao Mastani fit into our infrastructure. I learned two and unexpected cool things from this demo series. First, I understand SocialCops’ infrastructure so much better than before this series. I came into this series with zero engineering experience, and now I have a better handle on how our services and software relate. There are still things I don’t fully understand. But at least I now know what I need to ask about. Second, I got a great lesson about the importance of humor and visuals in telling complex stories. In my work at SocialCops, I sometimes struggle with explaining the technical aspects of what we do. How do I explain our entire data repository to people who don’t know the difference between primary and secondary data? How do I explain our entire technology platform to people who don’t know what it means to clean data? These infrastructure demos reminded me how invaluable humor and pictures are. Chetan knew that his audience had a wide range of experience — some people knew every detail being presented, while some people struggled to understand even the basics. That’s why his combination of silly drawings, crazy colors, lots of sarcasm, and a thorough technical base was so effective. The visuals and humor kept the non-experts like me entertained and helped us absorb complex information, while the technical details kept the experts engaged. Love communicating complex ideas or building complex systems? 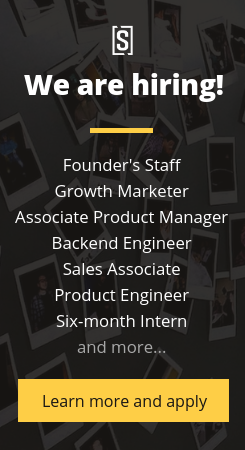 We’re always looking for passionate individuals to join our Product and Engineering team. Check out our open positions!